01. 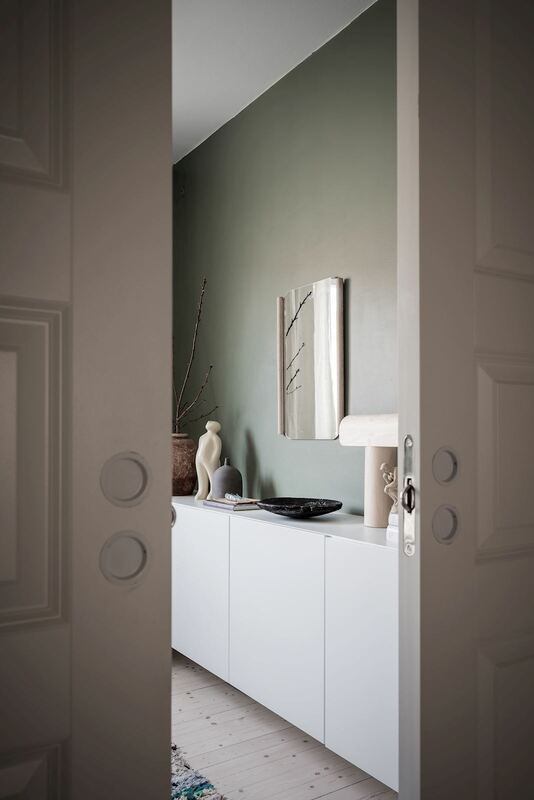 DCW éditions MANTIS BS2 wall lamp*, designed by Bernard Schottlander is my all time favorite bedside lamp, it ads some nice lines to a minimal bedroom look. 04. 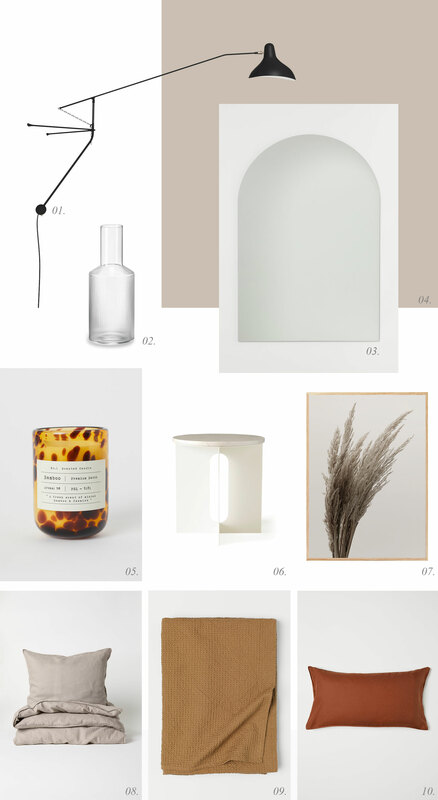 Ever since seeing this wall color in the Skagerak concept store in Copenhagen, I’m intrigued by Farrow and Ball’s Elephant’s breath color, perfect for a warm beige bedroom look. 05. One of my personal favorite candles*, a great warm accent color that is very affordable as well. 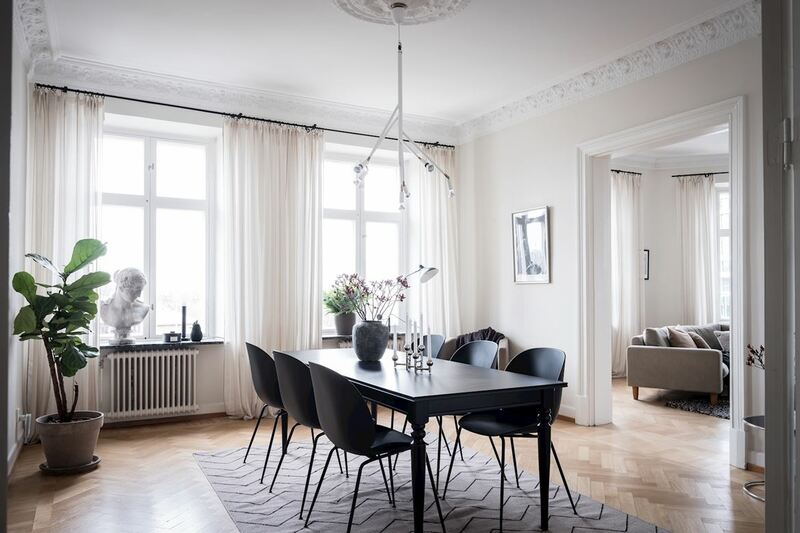 Gorgeous details and decor aside, this home has some great architectural details which are perfectly enhanced by the black paint. 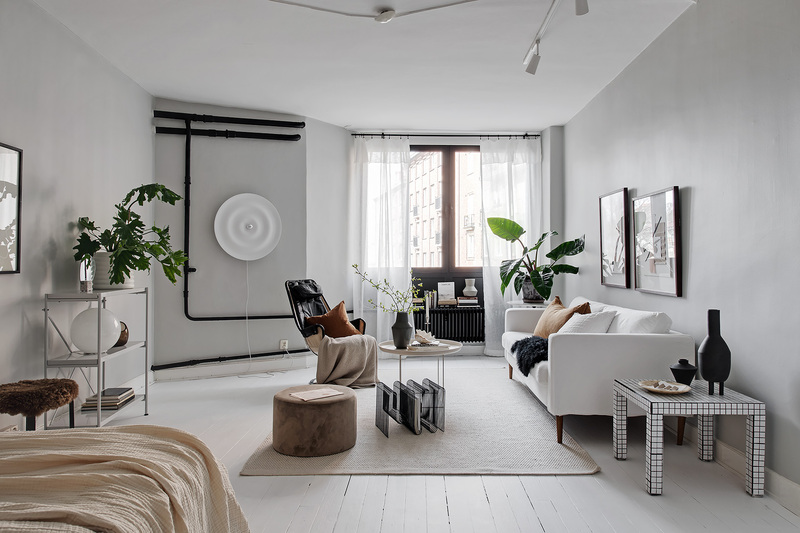 The windows, beautiful old heating elements and even the exposed pipes in the living room are all made into features and contrast so nicely against the bright white flooring and the soft grey walls. 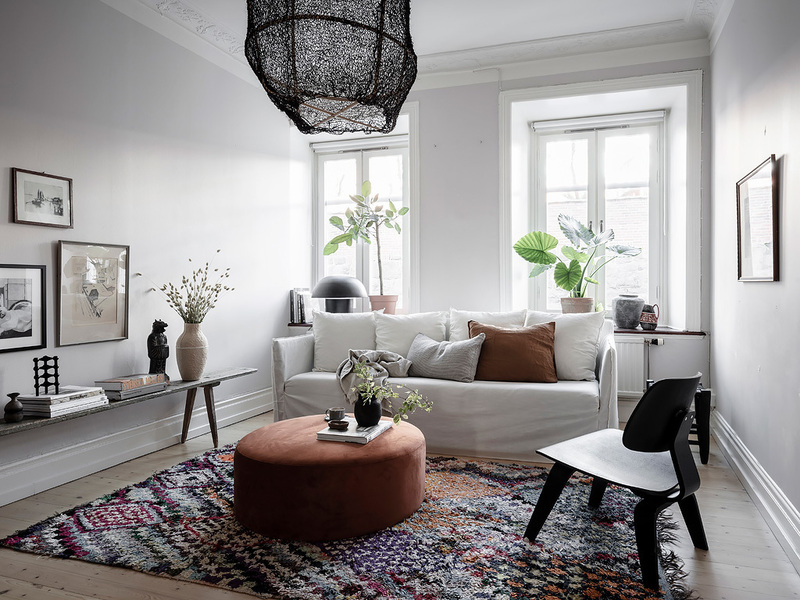 The decor on the other hand was done in very warm yet natural colors, which go well with the otherwise black, white and grey palette. 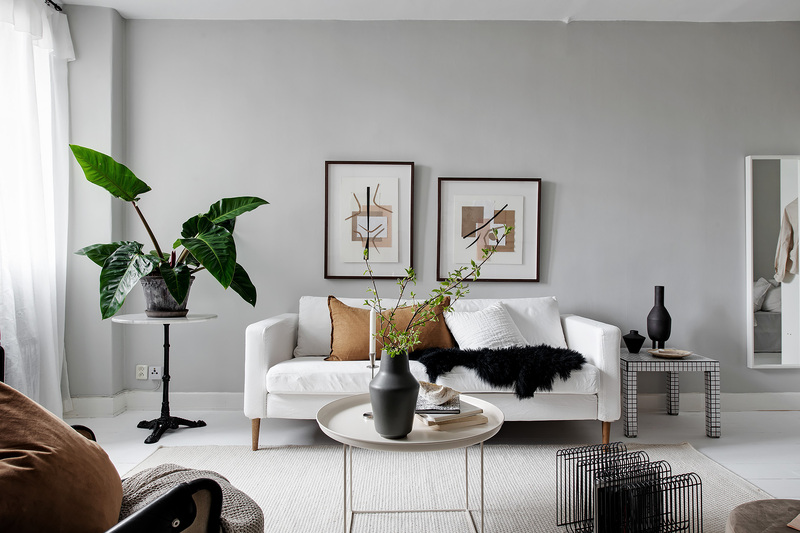 In the living room and bedroom the green plants really stand out and add a fresh touch among the otherwise beige colors. I can also spot this cool tiled Ikea table DIY project next to the sofa, wich is a project I have been wanting to try out forever as well. 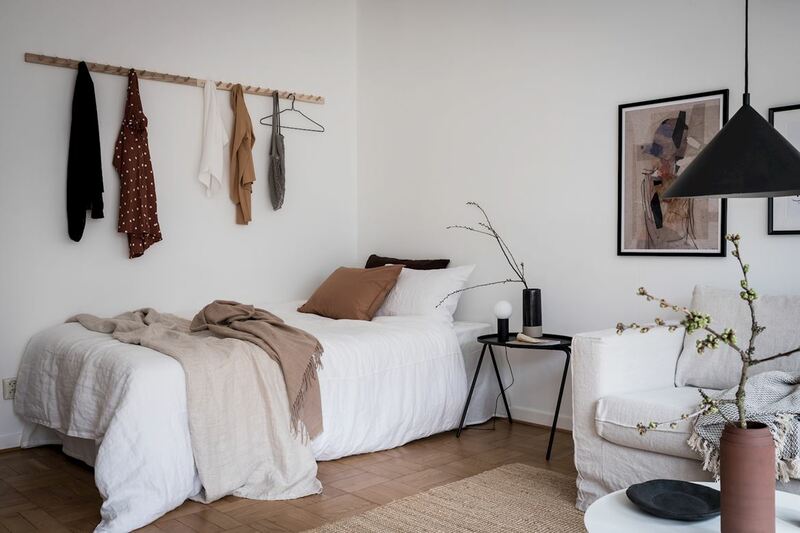 The bedroom corner looks really great with the beige art wall combined with the Ferm Living punctual shelving* , beige linen throw* and the cute HAY noc wall light*. 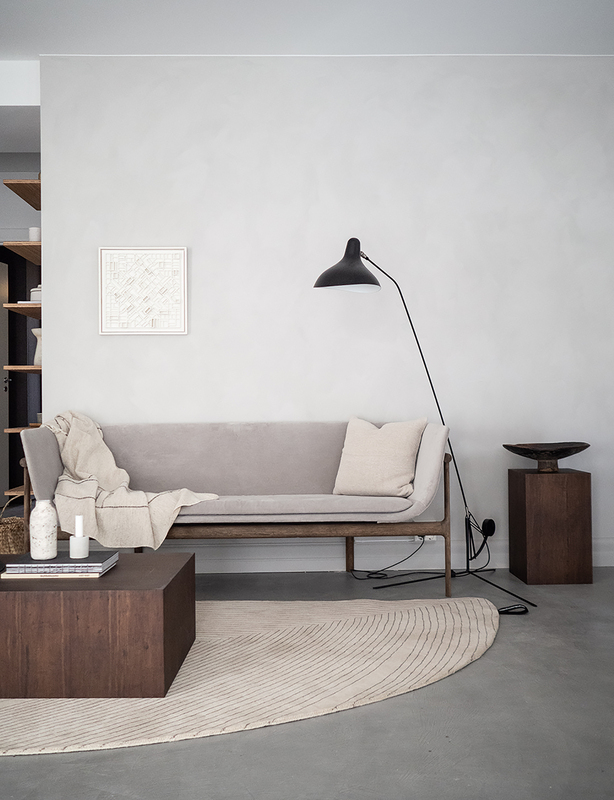 The little side table and the stool with the animal skin add a darker brown touch to this look, which finishes everything off perfectly. Lastly, notice the use of the niche in the kitchen as a little home office. 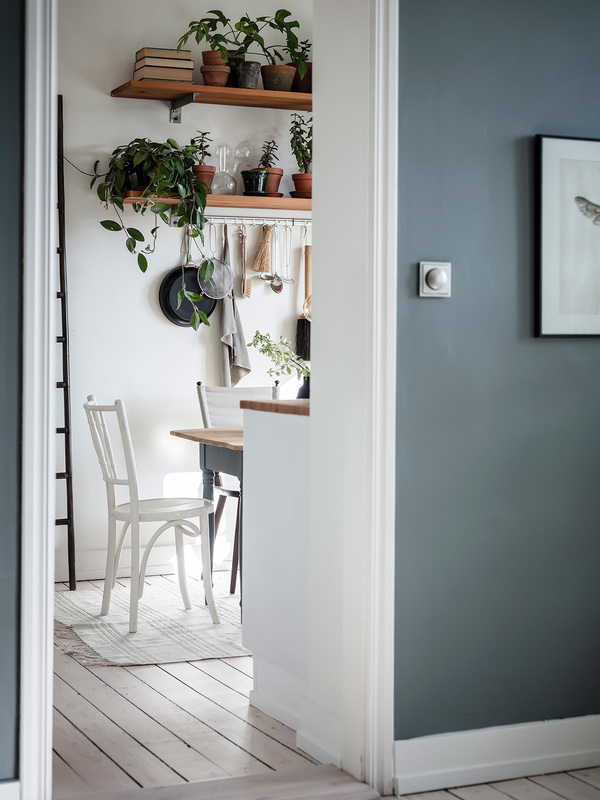 The old door there is a nice touch and the cables spread over the wall make for a perfect inspiration board. 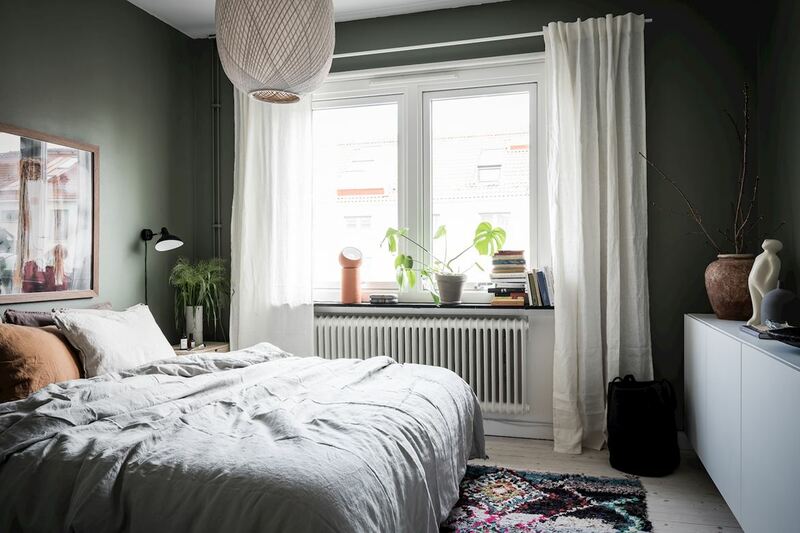 I really like this deep yet faded green color on the walls of this bedroom. 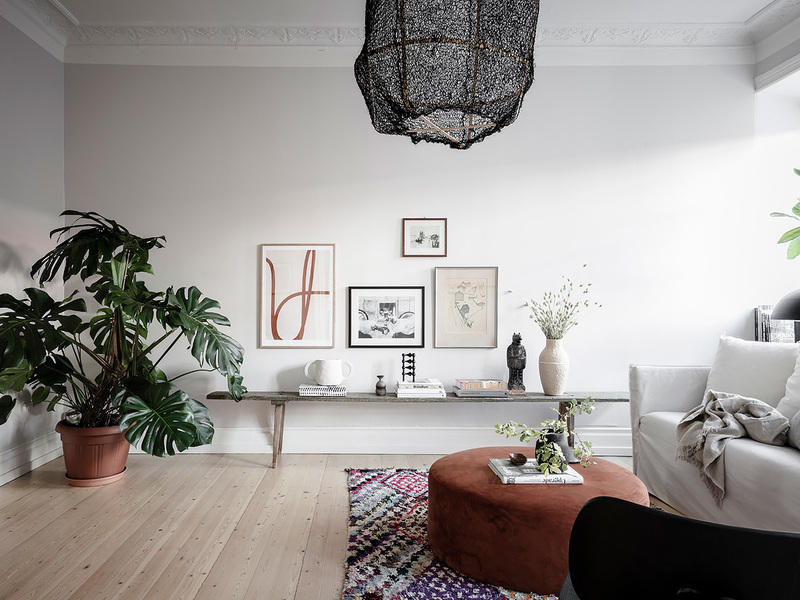 It makes the vibe of this room slightly moody, yet very cozy and fresh in a way. 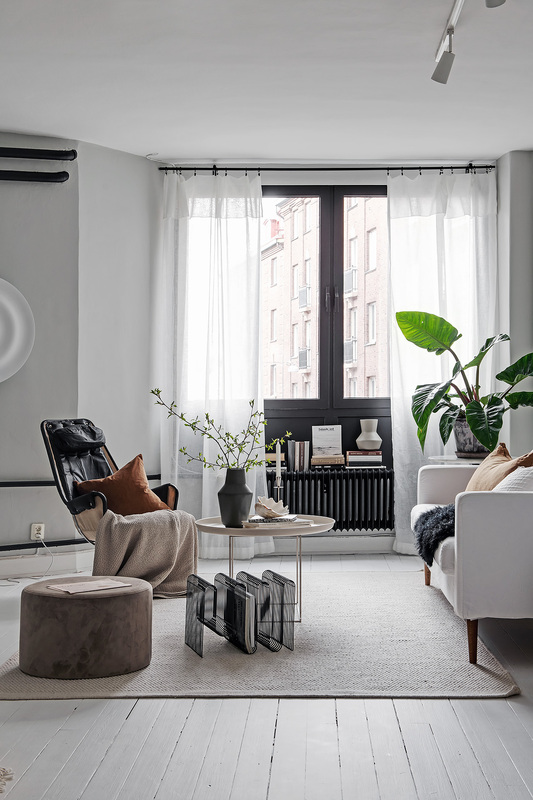 The light floor, the white Ikea Besta cabinets and the white linen curtains* really stand out against the dark walls which is such a great effect. 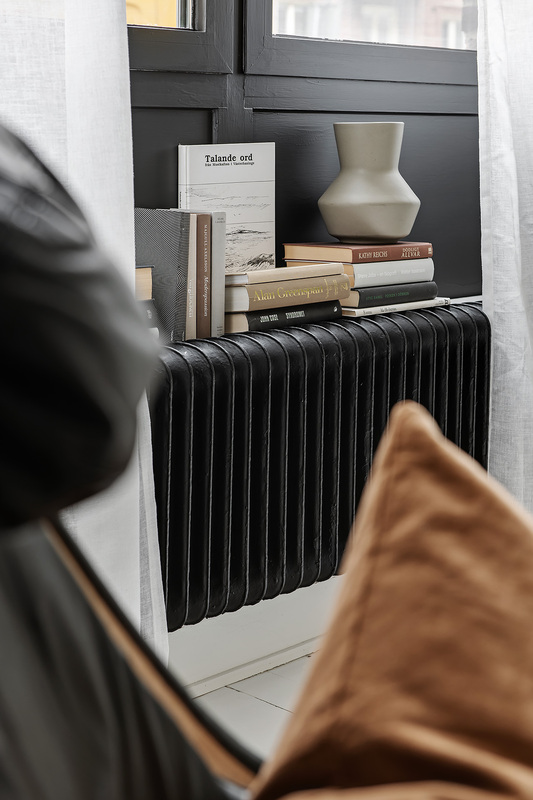 The details really stand out in this look I think, look at the subtile decoration on the sideboard. 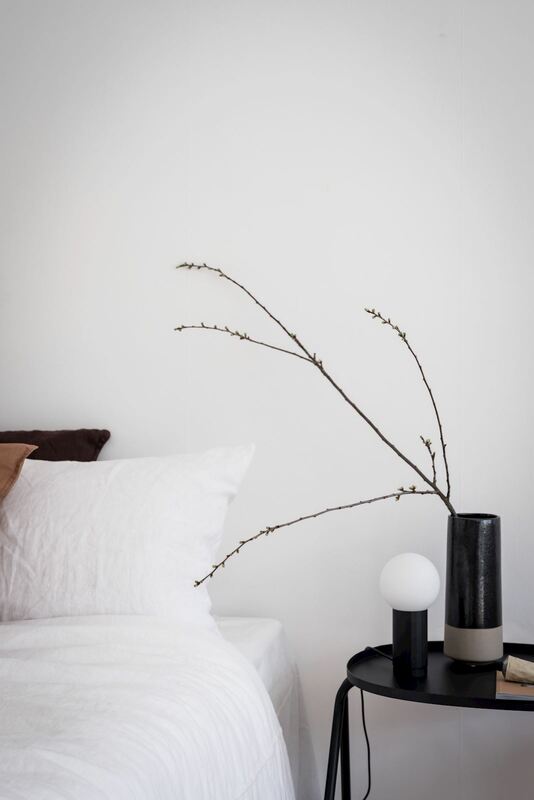 I also really like the Mantis wall lamp designed by Bernard Schottlander* as a bedside lamp. I’m looking for a small yet contrasting lamp for my bedroom and think this might be such a great choice. The bed is covered with a mixture of a grey linen duvet* combined with linen pillow covers in deeper tints. 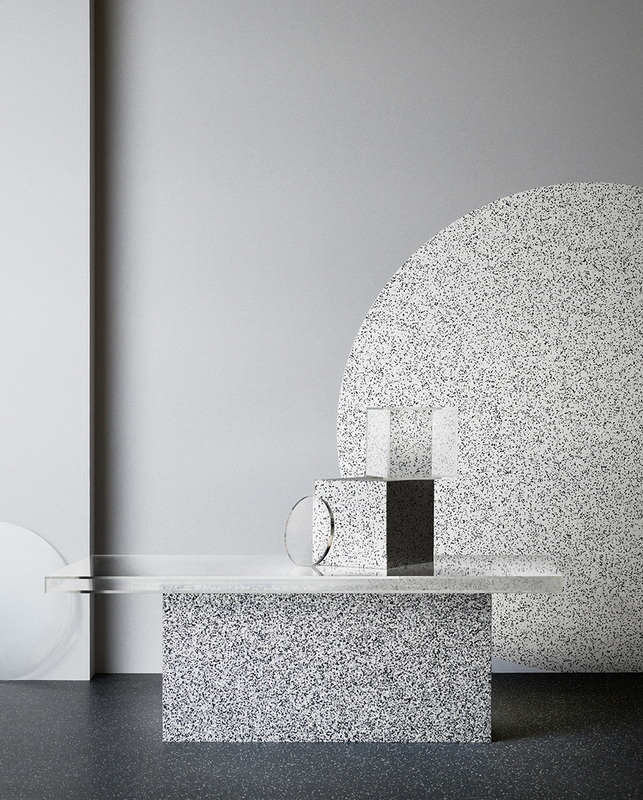 You might remember German design brand MYCS from when I showed you their customised black marble side table I had made for our bedroom a year ago. This piece is still one of my favorite pieces and has found a place in my living room in the new apartment as well (you can see it in this Instagram picture). I was so excited to be giving my living room a spring update with some of their products and love how this new look has turned out. I selected a set of their coffee tables as the center of this look and customised them in different heights and wood tints. I picked out a walnut and oak finish for the tables, which matches very nicely with the natural warm tint of the flooring in my living room. To match the coffee tables, I selected a series of throw pillows in different colors and materials. I went for a grey and green velvet pillow in different sizes combined with two neutral textiles that are different in texture. 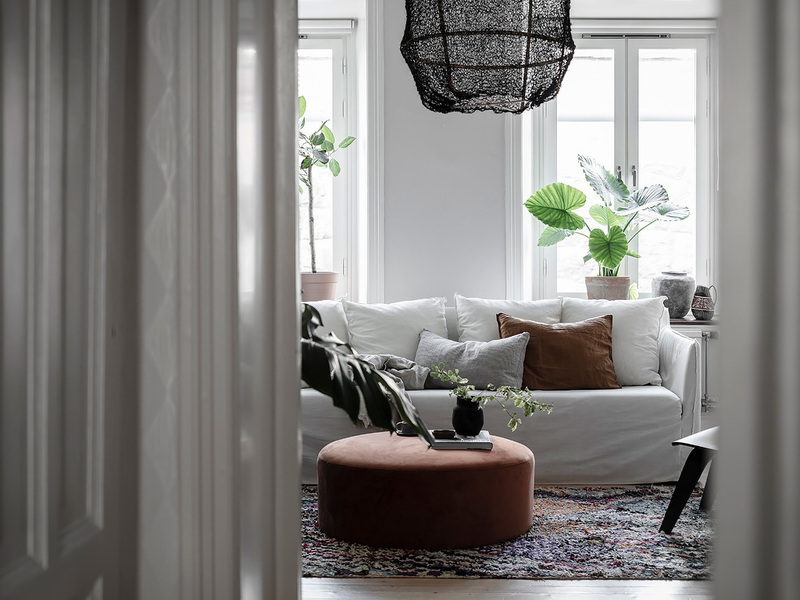 I’m in love with all the textures, materials and colors in this setup and think this is such a great way to give your space a little spruce up. 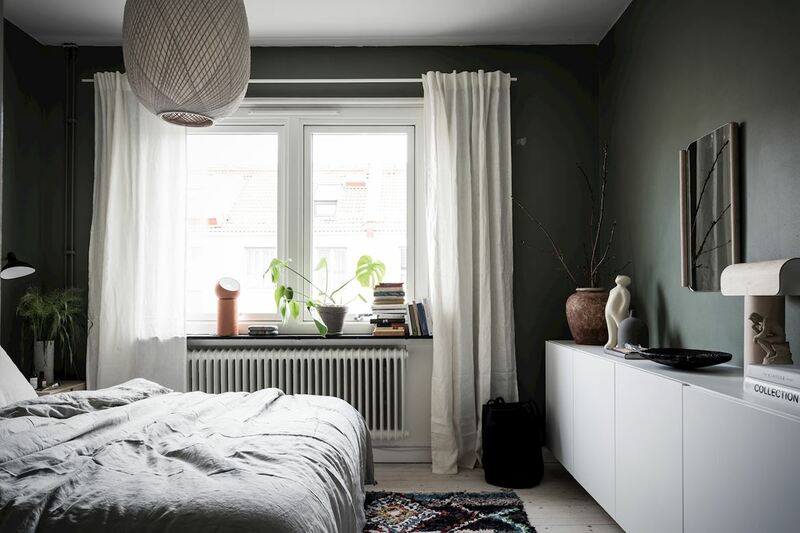 Pillows are the easiest way to update a space without breaking the bank and adding just a small pop of color (like the green velvet in this case) can transform the look of a room immediately. 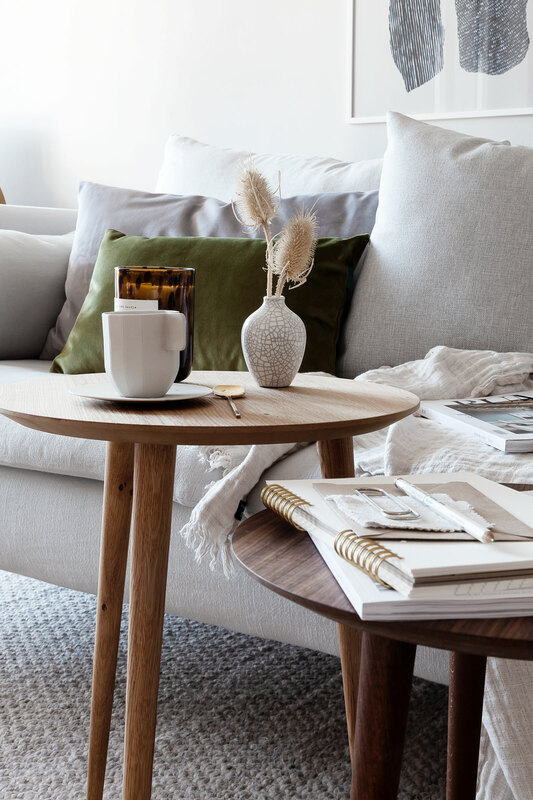 The coffee tables came flat packed, yet were super easy and quick to assemble and I love that they can be moved to other areas as a side table or bedside table. 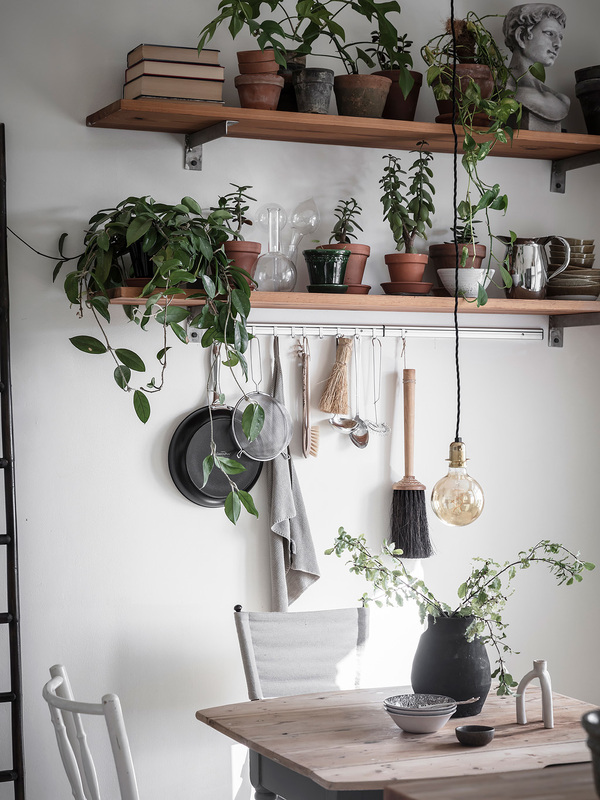 As you might know from previous posts, I like to move things around in my home and keep finding new arrangements so these versatile pieces come in very handy. This blogpost was created in collaboration with MYCS, however all opinions are my own of course. 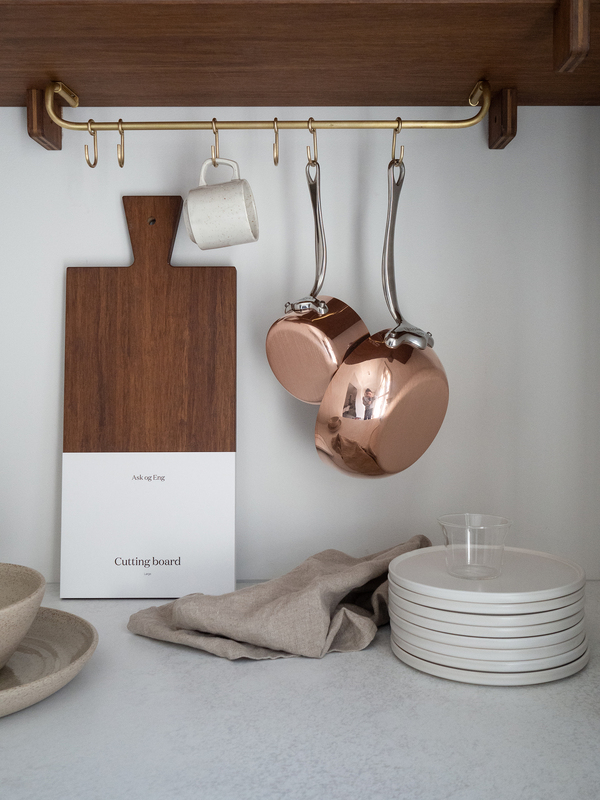 If you would like to know more about the brand and their designs, go visit their website or have a look at their inspiration section to get ideas on how to customise your own home. 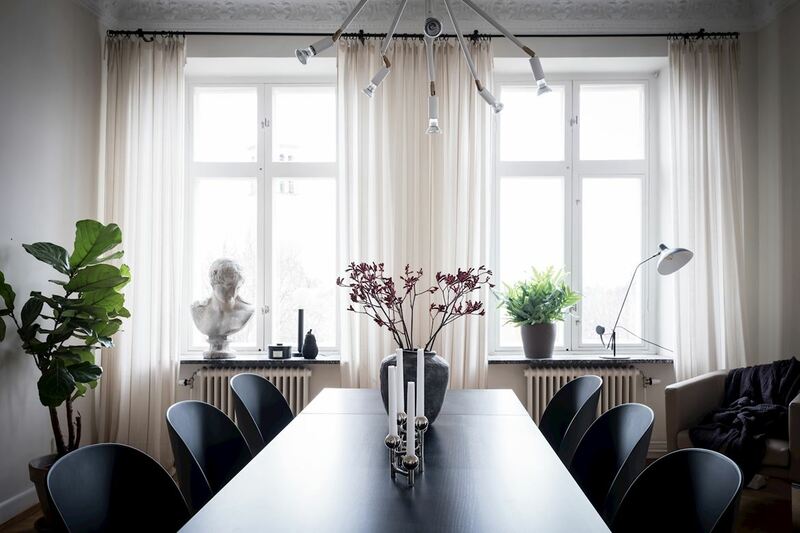 This is just sich a majestic and luxurious looking dining room isn’t it ? 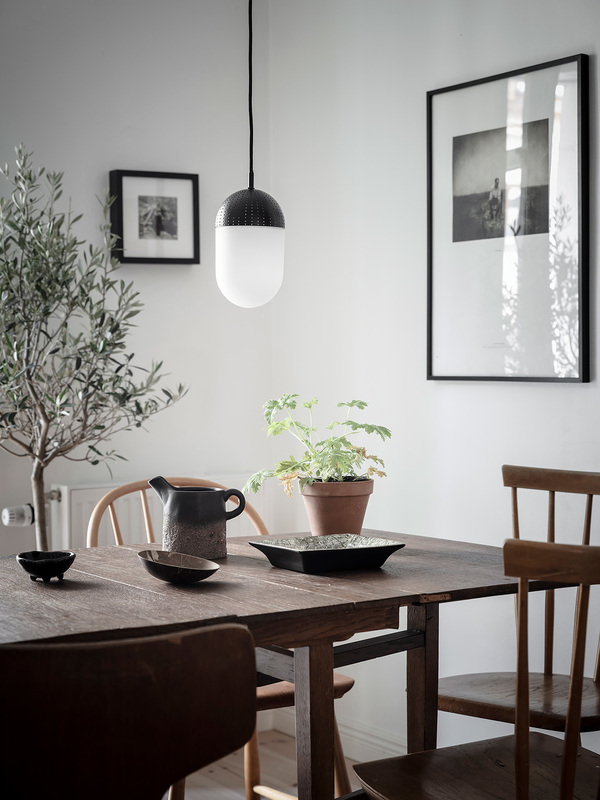 The combination of the black antique dining table, with the all black Gubi Beetle dining chairs* and the minimal white Kvist pendant light works so nicely and all that space around the table really brings the focus to the middle of the room. 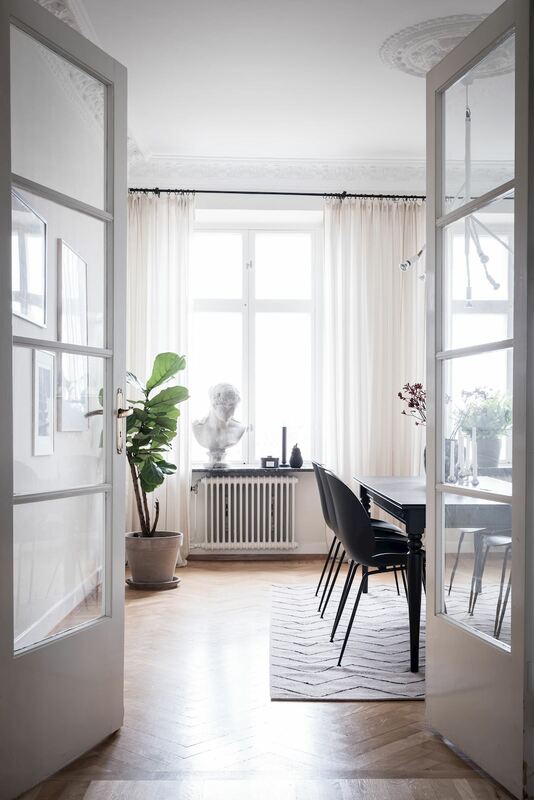 I also like the bust on the window sill, which enhances this classy look even more and the large fiddle fig tree in the corner next to the window adds a touch of green in this otherwise neutral color palette. 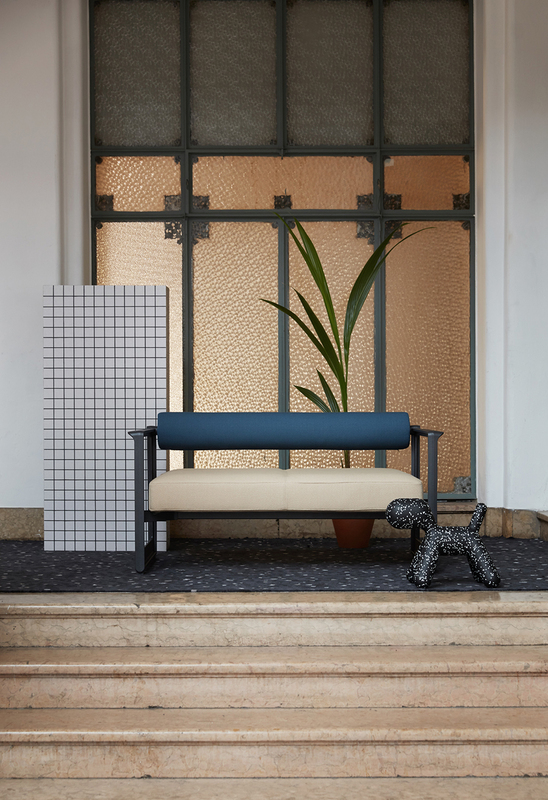 As you might have noticed on my Instagram, I briefly visited Milan Design week in the beginning of this week. I enjoyed strolling around the city and was able to see so many inspiring things on my super short trip, but one day is just too short to visit everything the city has to offer isn’t it ? 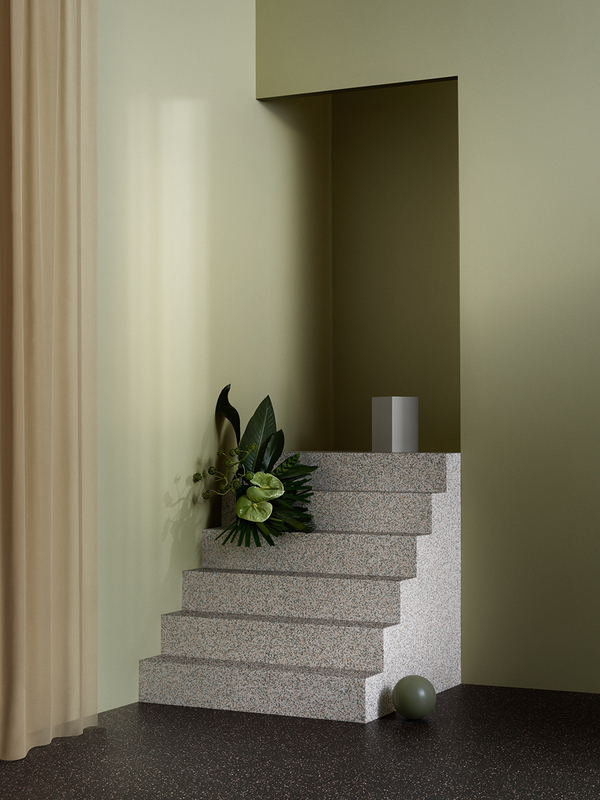 One of the exhibitions that I missed while there is the ‘Formations’ installation designed by Note Design Studio in collaboration with Magis and Tarkett at the Circolo Filologico Milanese. 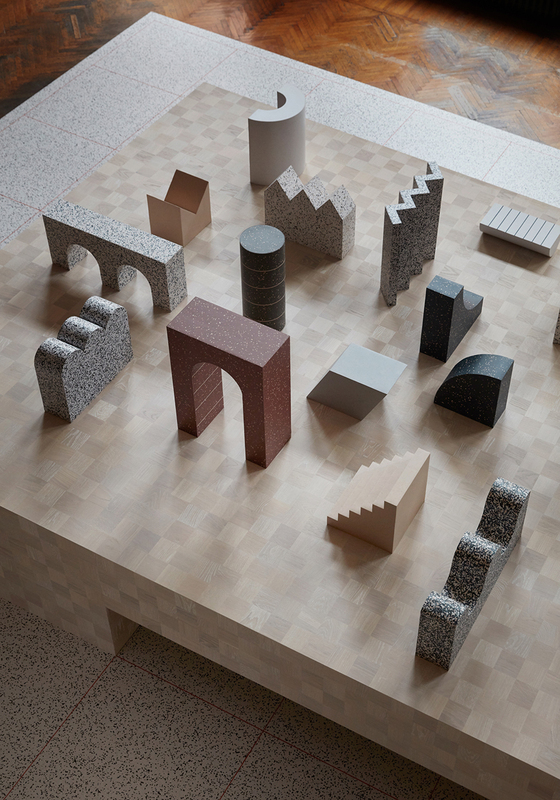 I love the play between shapes and materials and think it would have been even more impressive in real life. 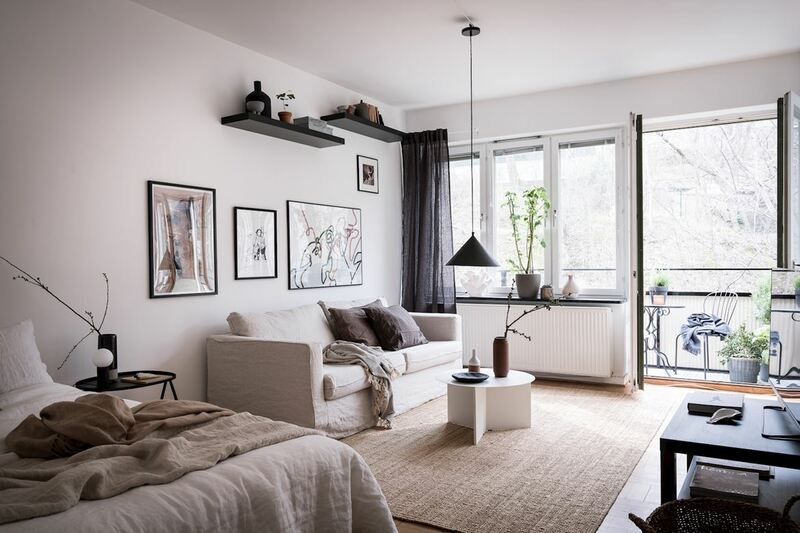 Another inspiring small living space where the bedroom is combined with the living room. 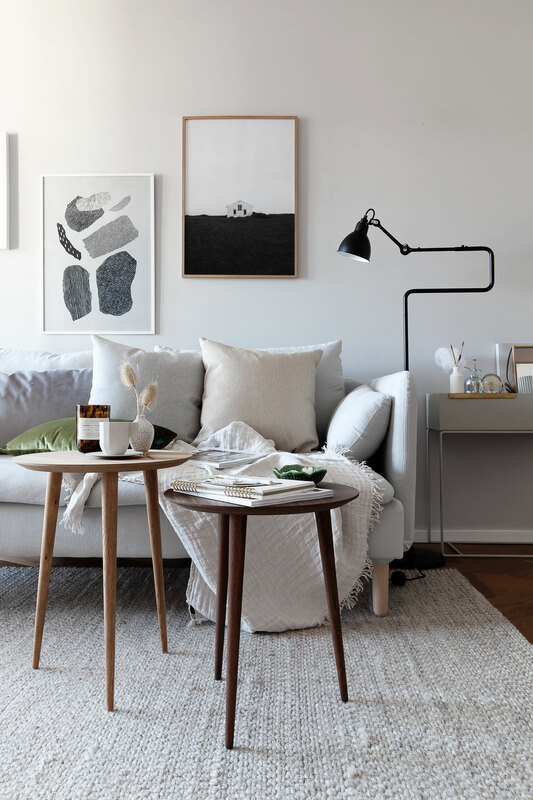 Living in a studio does not mean you have to compromise on style and this little cozy room certainly proves this ! 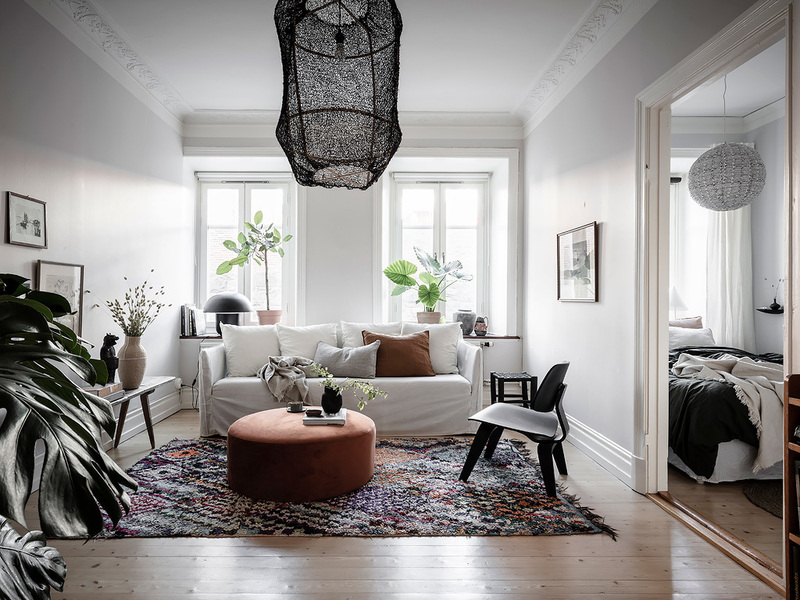 So how can you combine a bedroom and living room ? There is many ways of doing this of course, but a great way of doing this is to visually trick the eye into having two different areas. 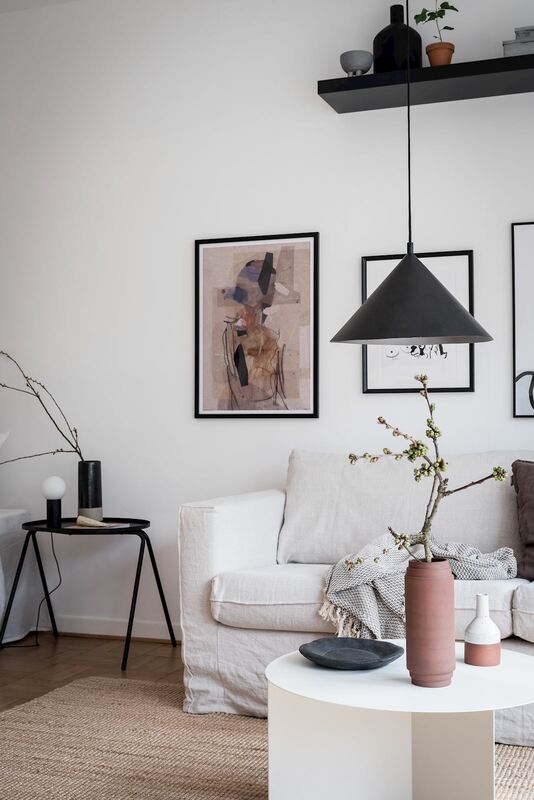 In this home they used a large area rug (I believe the one in the pictures is this one from Ikea but I’m not entirely sure) to separate the two areas and the art wall combined with the black shelving makes this division even more clear. 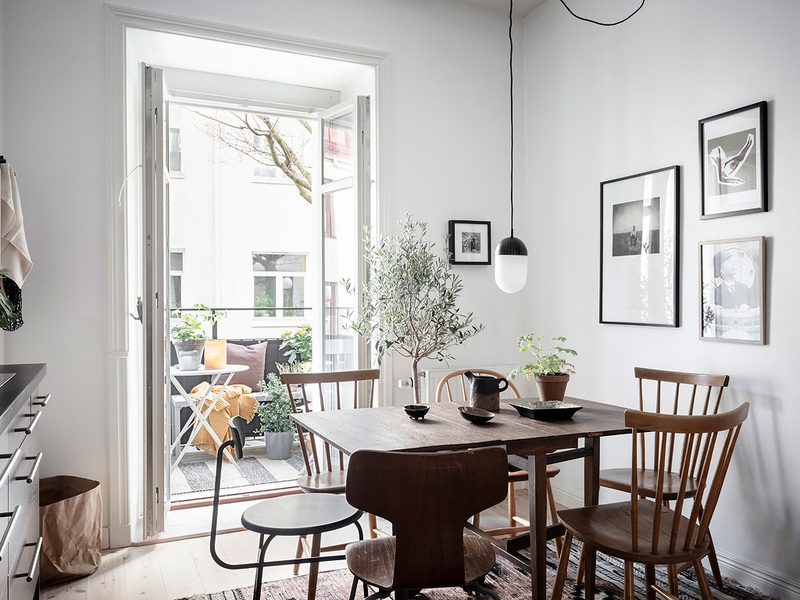 This home looks very cozy and inviting and the many vintage finds spread throughout this interior certainly have a big role to play in this characterful setting. In the living room the big vintage bench really stands out to me. 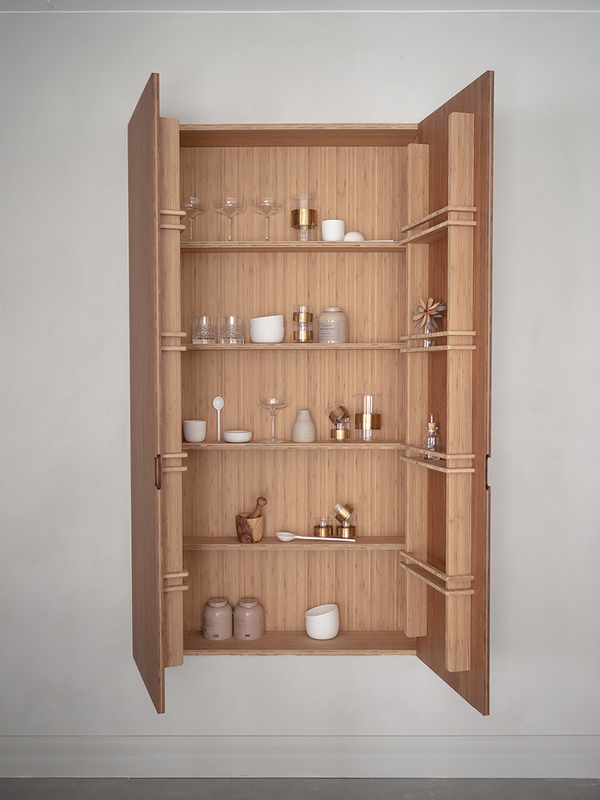 It’s a much lighter piece then a sideboard or commode, yet it serves as one. 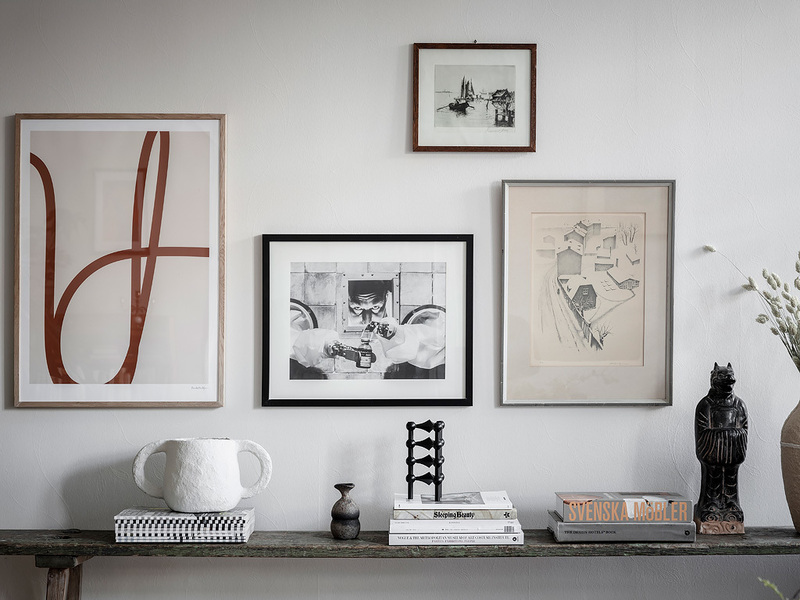 By adding an art wall above it, it becomes its own little area in the living room. 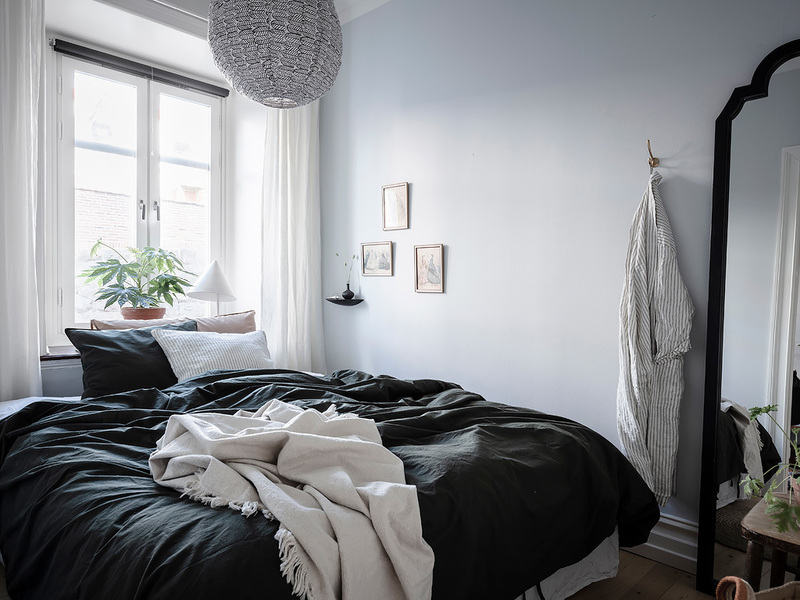 The bedroom walls are painted in a very light and cool blue tint, which works amazingly well with the dark and dusty pink bedding. 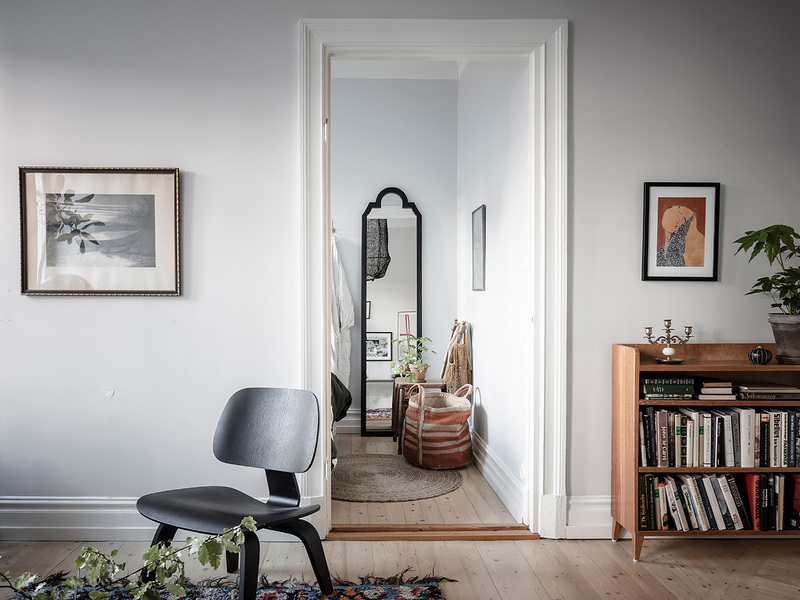 The antique chair in the corner ads a bit more character and how cute are those vintage frames combined with the Menu fungi shelf* on the wall ? 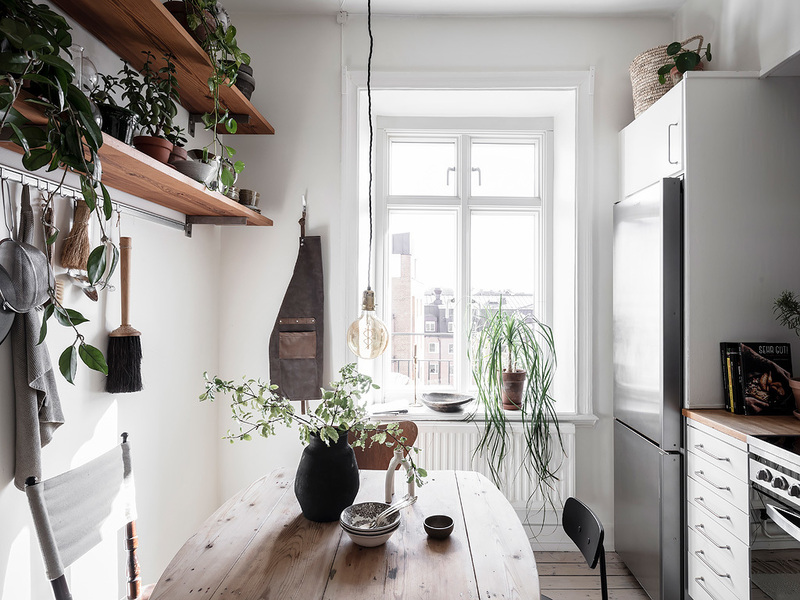 I’m in love with the plant wall in this cozy yet simple kitchen. 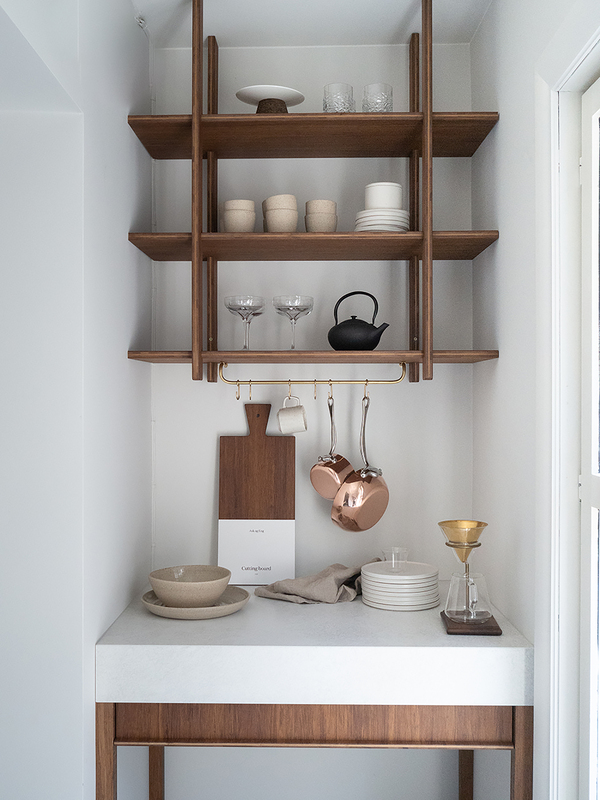 The rest of the interior is very modest, but the simple wall shelving with all the greens transforms this corner into a very characterful space. 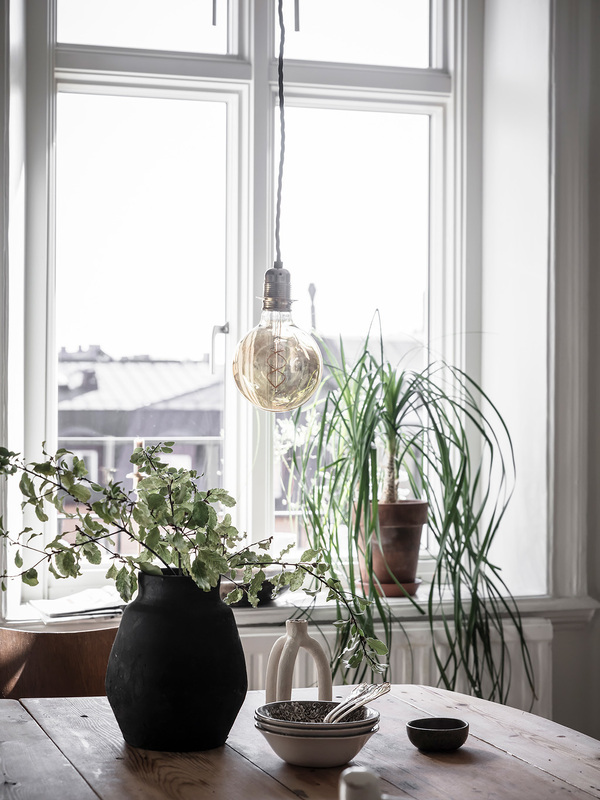 This is also a great way if you like to keep a lot of plants in the house but not all rooms have a lot of light. 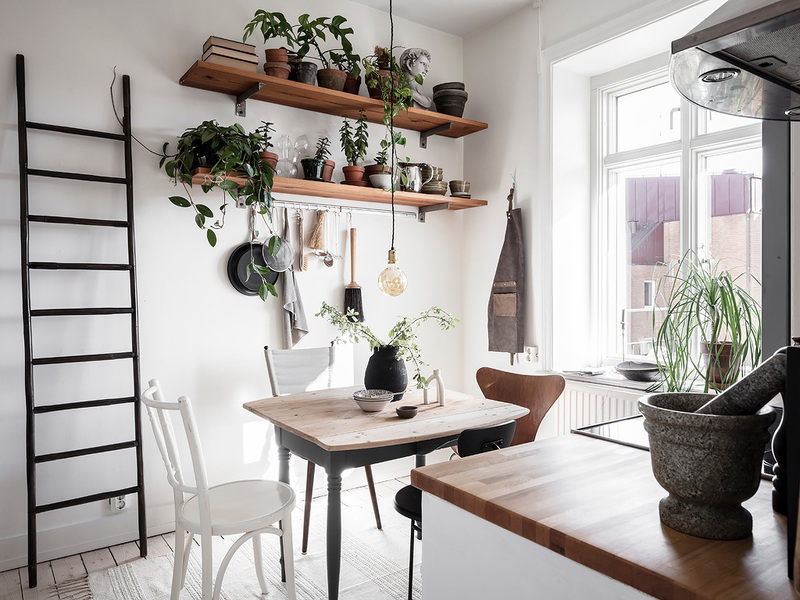 In my apartment for example, I don’t have any window sills in my living room, so hanging up a shelf like this could hold so many plants. 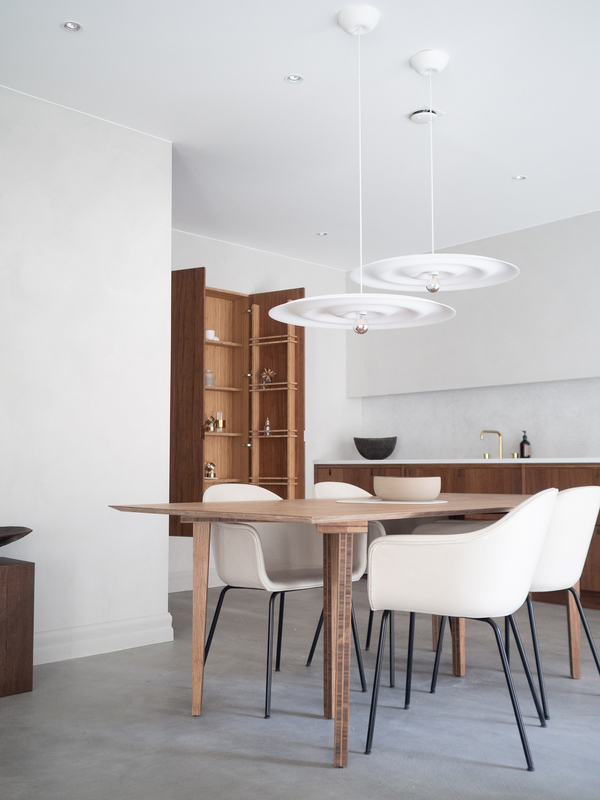 This is the beautiful new showroom of Norwegian design brand Ask og Eng in Oslo. 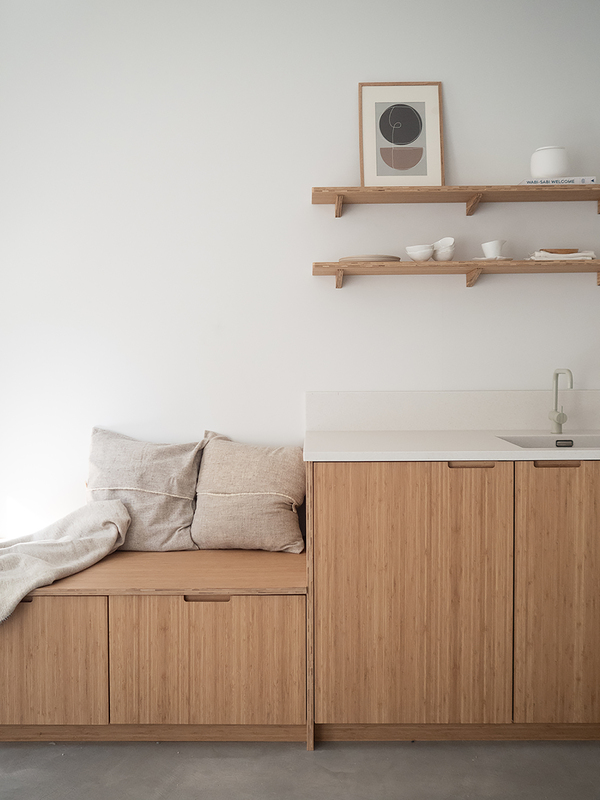 The brand started to produce sustainable bamboo kitchens in Drammen and has grown ever since. 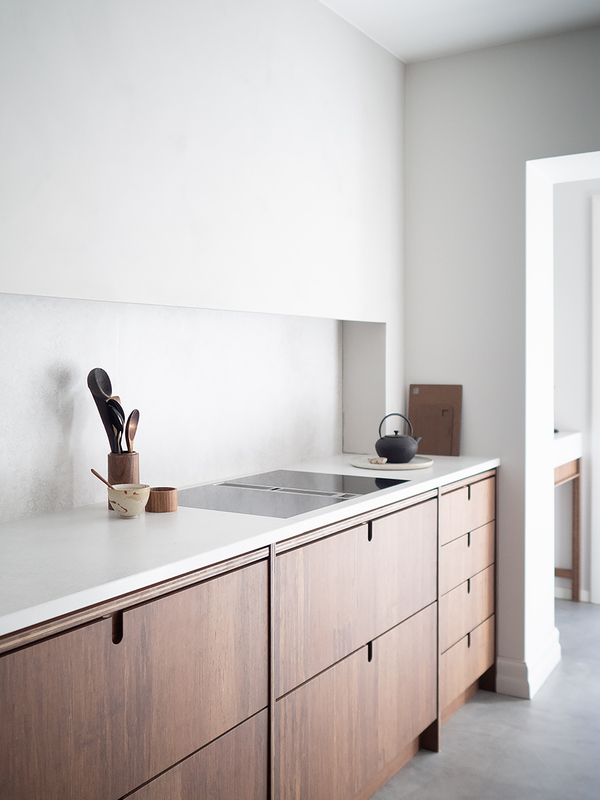 Kine Ask Stenersen and Kristoffer Eng founded the Ask og Eng studio early 2016, after having built several sustainable kitchens and furniture for them selves over a number of years. Their brand new showroom is such a great display of what is possible with their bamboo designs. I would love to visit it in Oslo some day.